B U B B L E G A R M: Enjoying the day.. Here's my look for today, very simple and wearable..
Face: BB luminous moisturising foundation, Benefit boing concealer under the eyes. Lips: Barry M peachy pink lipstick dabbed on lips with some Armani lip gloss and L'oreal Cappuccino lipliner. Eyes: Mac Natural Flare e/s quad, Maybelline great lash mascara and UD 24/7 liner in zero on the waterline. I used my conical wand yesterday and slept on it... this was the outcome. Yum yum :) hubby couldn't resist taking photo's of me during the process! love the new extensions & i used natural flare with my fingers the other day & you were right!! love the action shots also! Pretty! I wanted that quad but they had sold out in my MAC store I ended up with the fashion patch quad! Lol love the pictures of you eating the chocolate your too cute! You are so beautiful! I love the quality of your camera, what is it called if I may ask? I love the chocolate Monkey. Me and my husband have a thing about stuffed Monkeys. He used to buy me one now and again when he was travelling for work. I have a nice collection of them now. I wanted your advice if you recommend the BB foundation for dry/combination skin. There are some reviews that it is not long lasting and wipes off easily. You seem to like it and wear it a lot so was wondering what you think. I definately dont want foundation that will come off too easily. Sorry for the long post. Love the look of the day by the way. The extensions look so natural I would never have known you had them put in. 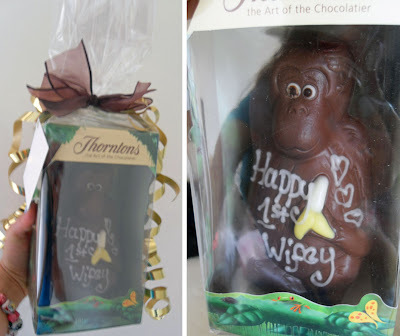 Your husband is a keeper, so sweet with the chocolate monkey. I think you look stunning this way! Very naturally gorgeous. Your hair looks great too. That chocolate monkey is the cutest, what a sweet little gift. You look so fresh!! I LOVE the pics of you eating the choc. monkey...they are so cute! If at all possible can you post a swatch of the L'oreal Cappuccino lipliner. I looked at the Loreal website but since I live in the US I cant see it on there. My luck they dont sell it here. Maybe there is something close in color to the one you use. Or I have to add it to my UK shopping list. I love your hair so much like this!! omg, the photos of you eating it are PRICELESS! Too cute! I love how your extensions look, they look so professional and like your real hair! I would never be able to tell! Your making me really want to buy that wand. I think I probably will at some point. lol And your necklace is fab, btw! the pictures of you eating the chocolate are so cute. i have no self control either when it comes to chocolate lol. gorgeous! I like that colourful necklace. And ohhhh chocolate. I'm hungry! hon u just have to dish on the nail polish color!!! The peachy pink on your lips is so flattering on you!!! You're gorgeous! I loved the pics of you devouring the monkey hahahaha so cute!! so happy your are having a lovely day!! I love love love long hair on you!! And your face looks so flawless.. I find those pics ur hubby took sooo lovely.. you know when you capture a special moment.. He saw how happy you were..
what did you get him btw?? What a nice lil hubby!!! YUMMY CHOCOLATE!! I love that mustard color necklace you are wearing. Fabulous!